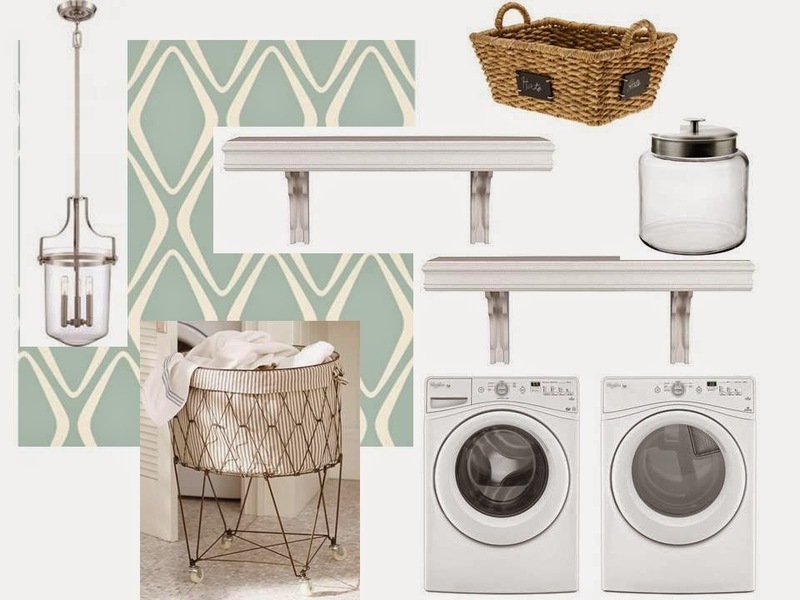 In yesterday's post I presented several dream laundry rooms. Any one of those rooms featured would certainly make laundry a bit less arduous. However, I live in reality, and in reality, my laundry room is not even close to any of those. 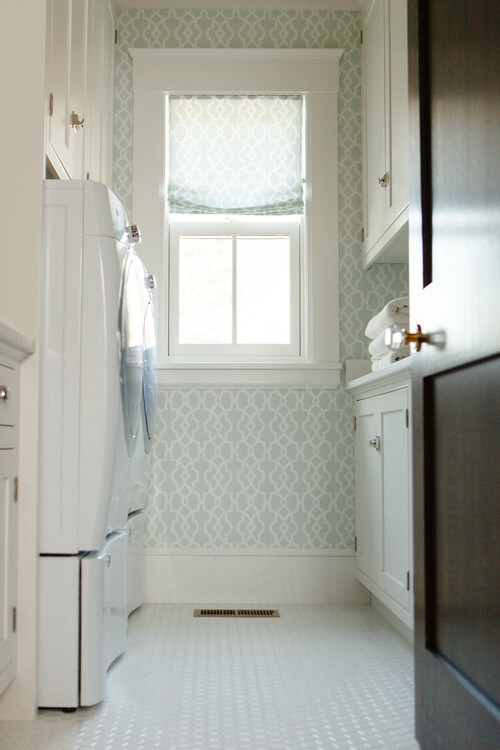 In case yours isn't either, here are some tips for livening up your laundry room. Even Target now has wallpaper selections. One of my favorites from their collection has some similarity to the paper in the photo above. Never underestimate the impact of changing a light fixture. Especially in a small space such as a laundry room, it will make a huge difference. So pull out that florescent light box and replace it with a lovely pendant lamp or small chandelier. Add a small area rug to the room. Be sure it does not overwhelm the space by taking up the entire floor, but choose a rug that is more than just a small mat. I am a big fan of using an indoor/outdoor rug in the laundry room. They are so durable and can sustain muddy shoes and detergent spills. If your room does not have cabinetry, opt for open shelving on the walls to give you extra storage space. Sturdy, deep shelves will be your best bet. Use a decorative bin or basket to hold your laundry essentials, such as stain remover and dryer sheets. This is especially useful if you are using open shelves. With shelves, you want to use baskets or bins to corral all the clutter and keep your shelves looking neat. Keep a large basket or bin handy to toss in all those random socks and dishtowels. This will keep them out of the way and off of the counter or top of the washer until you have a chance to wash that load. Add some fun accessories. Artwork, a cool rolling wire hamper, a glass canister to hold your powder detergent...all of these things will bring some fun and personality to your space.